Could Metal Disc Found on a Lyme Regis Beach Once Have Belonged to Mary Anning? A small, round metal disc about the size of a ten pence piece has been identified as having once been the property of Dorset’s most famous resident Mary Anning. The object may have lain buried for more than two hundred years on a Lyme Regis beach very close to where Mary found fossils of marine reptiles and Pterosaurs. Did this once belong to Mary Anning? The discovery was made by sixty-nine year old Phil Goodwin, a key metal detectorist who has explored the beaches surrounding the Dorset town on numerous occasions turning up such exotic finds as musket balls, old coins and a bayonet that dates from the time of Napoleon. Experts at the Lyme Regis Museum, which is situated on the site of Mary’s home close to the sea-front at Lyme Regis, have identified it as a metal disc probably given to Mary by her cabinet maker father. On one side of the disc the words “Lyme Regis” and “Age XI” – eleven can be clearly made out. 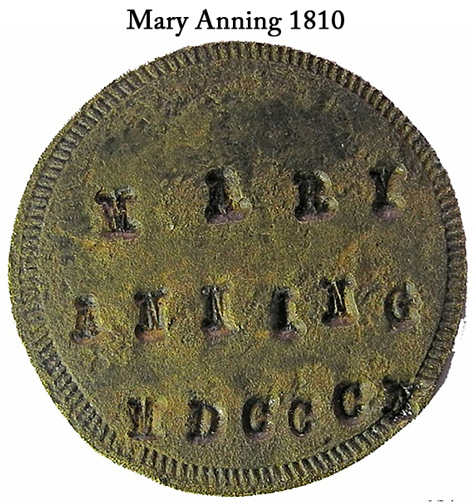 On the reverse, Mary’s name is stamped into the disc, along with the date 1810 in Roman numerals. Stamped on the disc are the words “Mary Anning and the year 1810 marked in Roman numerals. Did This Disc Really Belong to Mary Anning? The disc could have been stamped out by Mary’s father, perhaps as a birthday gift as Mary reached eleven. He would certainly have possessed the tools and the skills required to complete this fiddly task. However, the disc looks in remarkable condition and as we at Everything Dinosaur can testify, the tides regularly scour the beach and if the disc had lain on the beach for more than two hundred years, then surely it would have been washed away. Mr Goodwin and those who believe that the retired antiques dealer really has unearthed an object that once belonged to Mary Anning, explain the disc’s condition and its presence on the beach as Mary could have dropped the disc on the cliff above the beach during one of her many fossil hunting trips. Alternatively, it could have been thrown out and ended up in the local rubbish dump. A Victorian rubbish dump is slowly being exposed in the area of the Church cliffs to the east of the town and the frequent rock falls often deposit Victorian bottles and other debris onto the shoreline. David Tucker, the Director of Lyme Regis Museum with the Anning token. The disc has been put on display at the Lyme Regis museum, the picture above shows the Museum’s director David Tucker proudly showing off, what might be a link to arguably, the most famous female fossil collector in the world. Historians and archivists consulted by the Lyme Regis museum are convinced this disc was once a gift given to Mary Anning. The disc is very similar to the metal circles used by Georgian craftsmen to attach handles to drawers and other pieces of furniture. Mary’s father Richard, passed away in November 1810, six months after his daughter’s eleventh birthday. He had been in poor health for some time. It is quite a romantic thought to consider that this small disc was a token of affection presented to Mary by Richard, who knew that he did not have long to live and that he, her father would not see another birthday for his daughter. Sadly, Richard Anning would never know of his daughter’s fame. Mary Anning spent most of her time exploring the beaches and cliffs of Lyme Regis and nearby Charmouth. 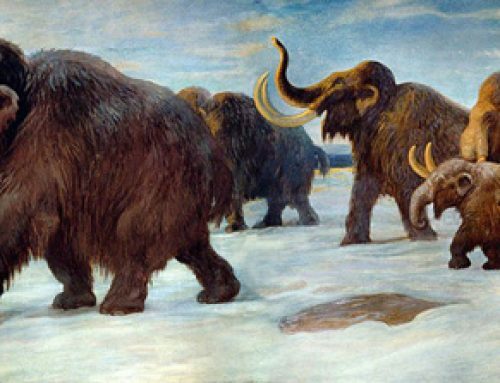 She and her brother had a remarkable record of important fossil finds. Mary and Joseph (her brother), found the fossilised remains of an Ichthyosaurus, the first to be scientifically studied and described. Mary also discovered a wonderfully well-preserved Plesiosaurus specimen and in 1828 the UK’s first example of a Pterosaur. A new species of Ichthyosaurus.